The dark side of Hollywood existed long before the film industry arrived in town. When Frank Kellogg Raymond made Hollywood his family’s home in 1901, many in town at once thought that his wife Kate was a bit odd. Frank worked in the government print shop in Washington D.C. and would spend one weekend a month with his family in Hollywood. Frank chose a neat little plot of land on the corner of Selma and Las Palmas and hired a contractor to build his family a home. Kate, however, would get involved and submit plans and specifications to several contractors. She promised to pay each of them, but failed to carry out her promises. Legal action was considered, but the idea was discouraged by Pastor Newell of the Presbyterian Church, who made it clear that the woman was mentally erratic and could hardly be held responsible for her actions. Fourteen-year-old Frank Raymond attended the local Fremont grammar school in Miss Willis’ eighth grade class and was regarded as one of her brightest pupils. His mother did not have many friends in Hollywood. Had it not been for Frank, Jr., who had a large circle of friends and was popular with most everyone in town, she would have lived the life of a recluse. Kate however, was clearly a brilliant and highly educated woman and had a small but significant library in her home. She was also an accomplished artist, having painted several beautiful pictures which decorated her West Selma Street home. However there evidently were problems at home and on occasions she made references to her husband who worked in Washington D.C., and with whom she said she could not live. She told neighbors that she came to California on account of Frank’s health but that the real reason was that she and her husband could not agree. What friends she had stated that she never made any definite charges against him, but, from her strange manner and her continual efforts to confide her troubles to someone, the information was not taken too seriously. In early 1906, Kate and Frank Jr. visited Washington D.C. where she attempted reconciliation with her husband, which was unsuccessful. Upon her return to Hollywood she appeared to be more dejected and Frank also reflected his mothers’ sorrows and illusions. After returning from the east she volunteered at a rummage sale for the Presbyterian Church where she said she worked hard and sold many items but didn’t take a receipt. Several days later it was whispered at the Ladies Aid society meeting that she had appropriated them. Some used the term kleptomania in connection with her name and others were less kind. The items were valued at less than a dollar. She evidently proved her innocence and wanted a letter of vindication but the pastor said that she was not a member and such a letter could not be given. It was also stated that it would be an admission that the church was wrong and so Kate may sue them for libel. She appealed to the minister, who she said “shut the door of his home” in her face and would have nothing to do with her even though she begged him to give her a fair hearing. She began to believe that Frank would be better off if she sent him to “his Maker.” She waited and finally the shame of what the women in the church had said about her worked on her conscience and she decided her son should be spared from the consequences of any sin she may have committed. Within a few days Kate attempted to buy chloroform from the local pharmacy, saying she intended to clean some clothes. The druggist argued with her about the amount she needed and offered to give her a small medicine bottle full instead. Because of this, Frank was summoned from Washington because Kate was about to be examined for insanity, but when she promised to accompany her husband back to Washington, no action was taken. At the last moment she refused to return east with him. Because the numbering of the streets were changed in Hollywood around 1910, the exact location of the Raymond house is not known, but it was near the intersection of Selma and Las Palmas Avenue (above). The address at the time was 450 West Selma Avenue. On Tuesday, April 10, 1906, Kate and Frank Jr. worked around the grounds of the house. Kate told the gardener, Mr. Cranblit, that the next day she would leave him a letter on the doorstep instructing him what was to be done, explaining that she might sleep a little later than usual and did not wish to be awakened. That evening she wrote two notes. One was addressed to her mother, Martha Cooper who lived in San Diego, and the other to Mrs. Cranbilt, the gardener’s wife. “My Dear Mother: To you I leave all in this house – what you care to give to Mrs. Cranblit. She lived in a little house in the rear, and has a warm, kind heart. This shock will nearly kill you, too, and our separation will not be for long. That evening, Kate waited until Frank went to sleep and then entered his room. He was lying on the lounge with his face turned towards her. She packed the door and windows with towels then locked the door and turned on the gas. Kate kneeled on the floor beside her son. The next morning, as Cranblit approached the house he detected the odor of gas. He rushed to the neighbors residences and, with two other men, broke down the rear door. The men were almost knocked to the ground by the amount of gas that rushed out of the kitchen. It was several minutes before they could enter. Once Cranblit could finally enter the bedroom, he found Frank lying dead on the lounge and Kate, moving slightly, was half way under one of the beds. Cranblit dragged Kate through the kitchen to the screen porch. Dr. Edwin O. Palmer, Hollywood’s city health officer was notified and a nurse was brought in to attend to Kate until she regained consciousness. “Where is my boy—my little Frank,” Kate asked. Neighbors who had gathered at the house did not speak of her son’s death, instead telling her that he had been taken away. They assured her that her mother was on her way to Los Angeles. When her mother did arrive later that night, she was met by her son, John Cooper, who took her directly to Hollywood. Cooper put the blame directly on his sister. Her inability to live with her husband was on account of her actions and treatment of him, and was due to her mental condition. Mrs. Cooper claimed her daughter was a victim of acute melancholia and was given to illusions. 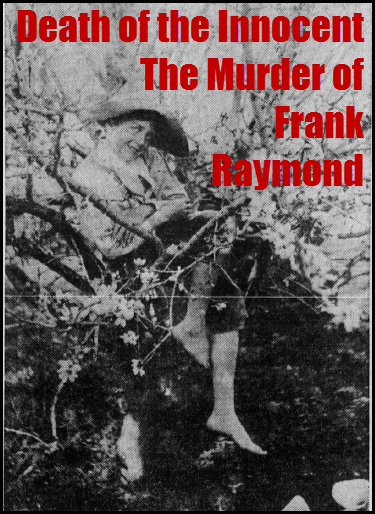 When Frank Raymond was wired of what had happened, the initial report was that both his wife and son were dead. “Mrs. Raymond killed herself and little boy last night. Wire instructions or come on,” read the telegram. Raymond left Washington that night by train for Hollywood. When the news of Frank’s death became known, it affected his classmates at Fremont grammar school. Out of respect for the dead boy the flag was lowered to half-mast and was kept there until Frank’s burial. In the meantime, Kate was taken to the county hospital and placed under arrest. When she was informed that her son was dead, she rejoiced and repeated: “I am glad he is dead. It is better for him. He is beyond wickedness now. I will kill myself when I have an opportunity. It will come, I am certain. They cannot prevent my killing myself. It is best for all concerned.” Over the next week Kate was closely watched, day and night, after trying to commit suicide by strangling herself in her bedclothes. On April 15, 1906 Frank Raymond arrived in Los Angeles. He visited the morgue to view his son’s body, but said little to the attendants at Pierce Brothers morgue. He spoke to Coroner Trout and although he had not lived with his wife for several years he refrained from saying anything bitter about her. However he inferred that he believed his wife was insane for some time, and that criminal action should not be taken against her for the murder of his son. The citizens of Hollywood were divided over her guilt. Nearly everyone who knew her believed that she was insane but there were others who said she should be charged with murder and be punished for her act. A former neighbor, J.G. Gunsolus and his wife believed that she was not insane when she turned on the gas and killed her son. Kate had often spoken to Mrs. Gunsolus about her family problems and had threatened to take her own life on several occasions. The following day the inquest was held at the Pierce Brothers where Frank Raymond was asked only a few questions. Kate’s mother told the jury that her daughter had been mentally unsound since the birth of her son. Other witnesses described the manner in which young Frank was put to death and told how they found the body lying on a little cot, while his unconscious mother was in a kneeling position by the bedside. Other Hollywood residents described Kate as erratic, peculiar and probably insane. The coroner’s jury took two minutes to find Kate Raymond insane. Frank Raymond sat close to his son’s body as the verdict was read. “We find that Frank Raymond came to his death through asphyxiation during the temporary insanity of his mother, Mrs. Kate B. Raymond,” the verdict read. It was suggested that Kate would, in all probability, be examined before an insanity commission in the superior court and sent to an asylum. That afternoon, the funeral of Frank Raymond Jr. was held in the chapel of Hollywood Cemetery. The grave of fourteen-year-old murder victim, Frank Raymond at Hollywood Forever Cemetery. Bottom center of photo is the tombstone of Frank Raymond. 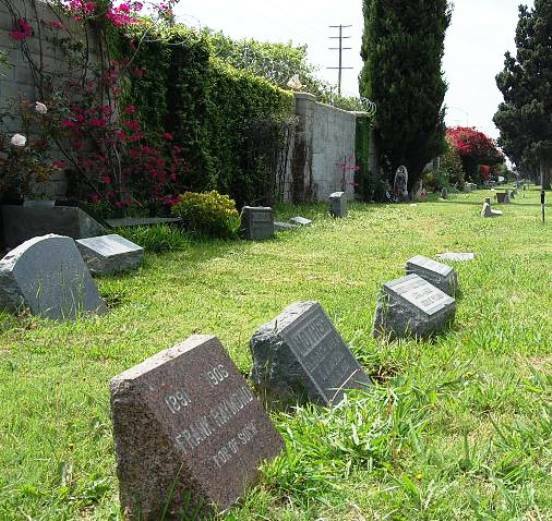 The grave is located in the far north eastern section of Hollywood Forever Cemetery. Afterward, Raymond paid a visit to his wife at the county hospital. 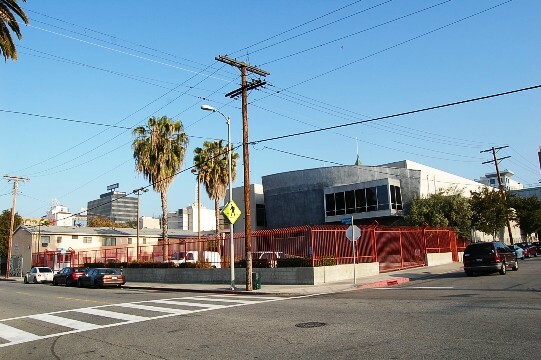 Kate was committed to the Southern California State Hospital in San Bernardino, California. 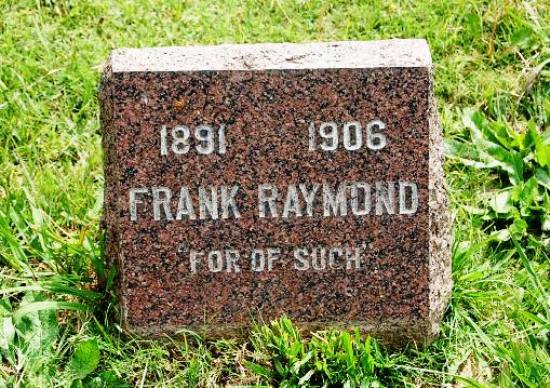 Frank Raymond divorced his wife and later remarried. He eventually became the private secretary for Congressman Thomas F. Ryan of Topeka, Kansas. Raymond died in January 1914 and was buried at the Congressional Cemetery in Washington D.C.
Kate was released from the asylum in early 1910 and took a ship to San Francisco and found a job as a waitress in a restaurant on Sixth Street. On the boat she met a man and got involved in a scheme with him, posing as persons of wealth. They checked into the St. Francis Hotel and cashed a bad check for $75. Her accomplice was arrested. Today is the 117th birthday of Virginia Rappe, who is best known for her tragic and controversial death in 1921. Film researcher Joan Myers is presently working on a detailed account of the Arbuckle trial. Virginia Rappe was born in Chicago on July 7, 1891. In 1907 she began working as a artist’s model; she quickly segued into the new field of commercial fashion modeling. For the next few years she traveled throughout the northwest and eastern seaboard doing live modeling for fashion shows and posing for advertising and fashion photography. In 1914 she began designing and marketing her own line of clothing; later that year she moved to San Francisco to market her designs at the Pan Pacific International Exhibition. In the spring of 1916 she decided to try for a career in films and again relocated, this time to Hollywood. She continued her modeling career in Hollywood. In early 1917 she was hired by producer Fred Balshofer and given a prominent co-starring role in Balshofer’s Paradise Garden opposite screen idol Harold Lockwood. Balshofer hired her again the next year to co-star with popular cross-dresser Julian Eltinge and newcomer Rudolph Valentino in Over the Rhine. This film was not released until 1920 when Balshofer recut it and released it under the title An Adventuress. In 1917, Rappe began a relationship with comedy actor/director/producer Henry Lehrman. She appeared in at least four films for Lehrman: His Musical Sneeze and A Twilight Baby (1920) with Lloyd Hamilton, Punch of the Irish (1921) with Frank Coleman and Lige Conley, and A Game Lady (1921) with Hamilton and Coleman. All but two of these films (A Twilight Baby and Punch of the Irish) are lost. It is possible Rappe may have had additional roles with Lehrman, but none have so far been identified. On September 9, 1921, four days after attending a party thrown by Roscoe “Fatty” Arbuckle, actor Lowell Sherman, and director Fred Fischbach at the St. Francis Hotel, Rappe died of a ruptured bladder in San Francisco. Arbuckle was arrested for her murder the next day. The murder charge was eventually reduced to manslaughter, for which Arbuckle was tried three times. The first two trials ended in hung juries; Arbuckle was acquitted of the charge at the end of the third trial, but his career was ruined.